Regarding diseases of the 21st century, emerging and re-emerging infectious diseases should be noted in addition to metabolic syndrome, cancer, and others. Most pathogenic microbes carry carbohydrate chains on the surface. Many enveloped viruses and some of the non-enveloped viruses express carbohydrate chains. Their carbohydrate chains play important roles in escaping from host immune systems and invading the host. 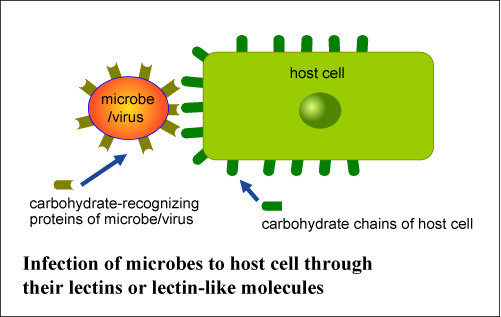 Some microbes and viruses utilize the carbohydrate chains of the host cells for infection. In this case, they are using their carbohydrate-recognizing proteins; lectins or lectin-like molecules which tend to be called by other names, such as hemagglutinins, adhesins and toxins. Biological recognition systems involving carbohydrate interactions may have contributed significantly to the evolution of the interaction process between viruses/microbes and host animals. This means that study based on the glycomicrobiology is indispensable in the battle against infectious diseases. This site contains comprehensive studies on carbohydrate-related science regarding viruses, bacteria, protozoa, molds, and other microbes. The authors welcome informed reviews and opinions on the research and study of glycomicrobiology. Many people were convinced that remarkable medical advances would eliminate the various human infectious diseases caused by viruses, bacteria, fungi and protozoa from the world by the end of the 20th century. However, the threats of emerging and reemerging infectious diseases have increased year by year over the past two decades. Researchers have suggested the following reasons for this. Large-scale deforestation in tropical regions has increased the opportunities for human beings to encounter infectious organisms which were previously unknown. Global warming is changing the weather of the temperate zone, and these changes generate infestation by vector insects including mosquitoes and flies. Massive air transportation made possible an ever-increasing movement of people, spreading infectious organisms throughout the world. The SARS epidemic emerged in 2003 and now the world faces the significant problem of an avian flu pandemic. In the current fight against emerging and reemerging infectious disease, we expect glycomicrobiology to contribute greatly to the research. Clarifying the role of glycans in infectious diseases will provide key information in meeting the difficult challenges that lie ahead.